Google Update on 30th November 2018 - A reversal of the 16th Update? Google Algorithm Update on 30th Nov. 2018 - A reversal of the 16th Update? The SERP tracking tools show a spike in volatility on the 30th November, which is of similar intensity to the 16th. Published: Dec 3, 2018. 10:52 UTC. Current: Google Algorithm Update on 30th Nov. 2018 - A reversal of the 16th Update? I’ve been checking the sites hit by the latest update, and it would appear that this latest volatility is indicative of a reversal of the update I reported on in detail on the 16th November. In the 16th November Update, I concluded that Social Media sites took a hit, with news websites seeing an increase. I reported previously that we had two outliers, Wikipedia and YouTube. It would appear that Wikipedia has regained the visibility they lost, but YouTube did not see their improvements in the 16th update disappear. Some bias maybe? As this appears to be a simple reversal, I will keep this post quite short. However, I would say that the 16th update could be a sign of things to come, so you may want to read my previous post and follow some of my guidance I put there. 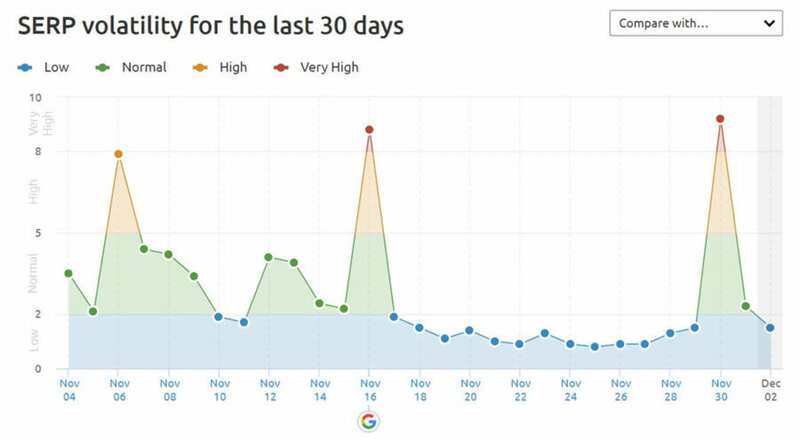 The SEMrush Sensor shows a clear spike on November 30, 2018, at a similar level to the 16th of November. SEMrush Sensor 2nd December 2018. © SEMrush. The Rank Risk Index tracker shows a larger spike in volatility than the 16th. Rank Ranger Risk Index 2 December 2018. © Rank Ranger. The MozCast weather report shows a similar spike in SERP volatility on both dates. Mozcast 2 December 2018. © Moz. As I mentioned at the start of this post, this update appears to be a reversal of the 16th November one. Take a look at the winners and losers visibility chart for the 16th November at Searchmetrics. You can see that it is almost a full reversal of the previous update, with Social Media websites recovering some visibility, and News websites losing all if not more of their gains. While the directory site YellowPages.com recovered, Yelp did not. YouTube did not lose the gain in visibility they received from the previous update. The net gains and net losses are not an identical reversal in scale. A large website, SearchEngineLand, was temporarily de-indexed as Google mismarked it as being hacked. I mention this, as comments have been made on SEO forums that this was a possible cause. The visibility charts above clearly indicate it was not. However, it may account for some SERP trackers showing slightly higher volatility on this date than the 16th. It is, therefore, possible that you may not have seen a recovery from the 16th update, and if so, you should read the advice I gave in my previous post carefully.